regeneration more than green.” Well, that’s an optimistic choice for the new year. Sherwin Williams has videos for color stories with names like Midnight Mystery (“The colors are moody, the vibe is masculine and the aesthetic is both Victorian and futuristic.”) Watch the video to see how they match the colors with the words and ideas. If you want to surround yourself with a color you find inspiring, Sherwin Williams offers an app for you phone to color match whatever you photograph with a paint. I’m not suggesting that I do or you should follow seasonal color trends, but I find it interesting to see how other artists pair content with color choices, and how this reflects the mood/s of the times. The color forecasting people do an interesting job with this. The ideas that color and value choices (and thereby focus) are about more than being “pretty” or appealing – that color and value carry emotion and meaning – help to shape the works that bring your values to the table. We need, in both real and metaphoric terms, more people bringing personal values to that table. 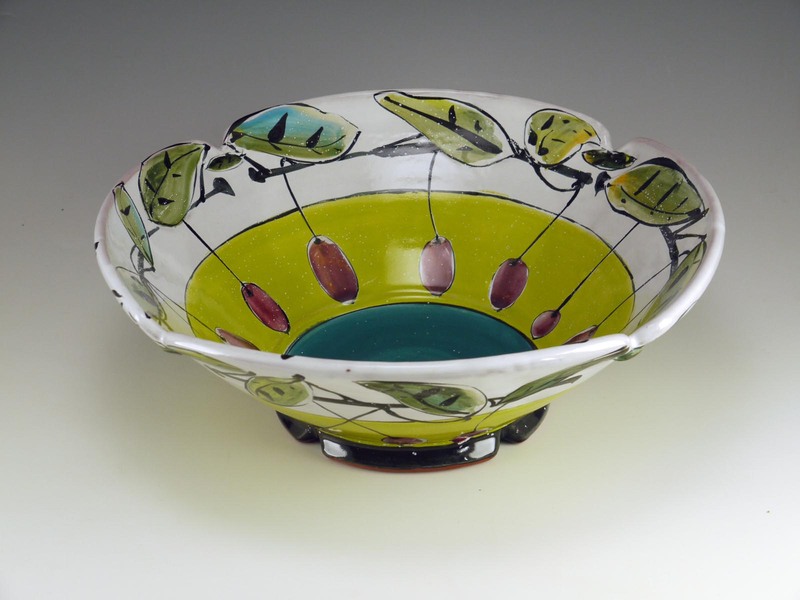 Below, a bowl that features a yellow-green next to a cool teal, accented with purple fruit. Chartreuse can be a color that denotes envy, to me. “Green with envy” doesn’t seem emerald-colored, but more sulphurous green. It’s easy to mix by volume for majolica decoration with a bright praseodymium yellow stain and copper – mixed 1/2 bentonite: 1 copper: 3-4 yellow stain: 3 frit 3124 or similar. Add a couple drops CMC gum or glycerin if you choose. Too much gum makes it slippery and hard to put down evenly. I do love that color, in general. It’s also the color of new leaves in many plants, and the color of sunlight through new leaves – I see it most often as a growing, optimistic color. In this bowl, I imagined the fruit as the fruits of one’s labors, and being a bit envious of the ripeness of that fruit. The purple-toward-red is a complement to the green-toward-yellow, making both colors richer. The teal is a darker value, and makes the bottom of the bowl recede. 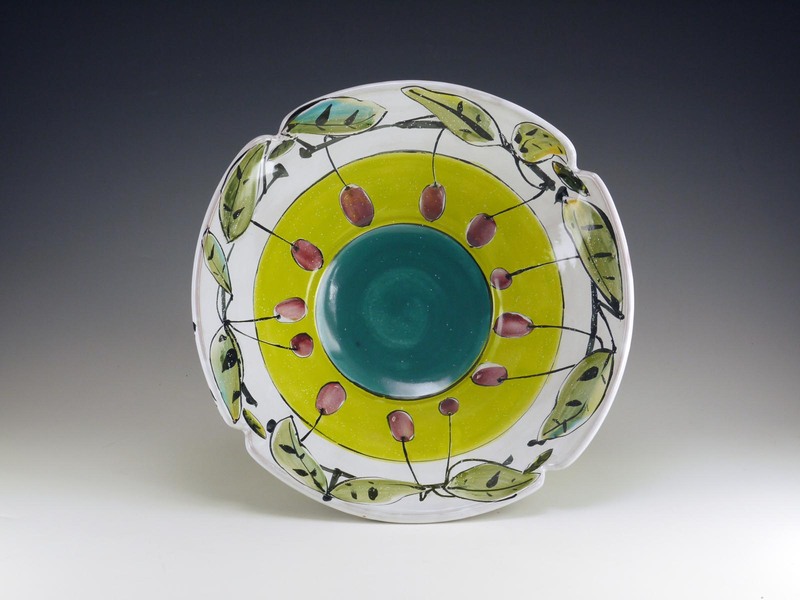 The white rim (and lighter value of the leaf colors) helps the form expand visually toward the top, with a re-statement of green and blue-green to link to the rest of the bowl. My sister, Robin Wagner, is a clothing designer specializing in knitwear. She’s alerted me to color forecasting, an important concept in her field, and the industry of color forecasting. Designers may pay to subscribe to a service that determines what the trendy colors for future seasons will be. If you’re of a certain age, you’ll remember the flood of Harvest Gold and Avocado appliances that parents handed down (by then well OVER these colors) for your college apartment? Remember the summer season in fashion when so much was safety orange or chartreuse? Looked great it you had a dark tan, but otherwise questionable. These are the effects of color forecasting in industry. The forecasts come out well in advance so that designers can work on palettes – color stories – for their lines. January 3rd, all too soon, I leave to teach a 2-week class at Curaumilla Art Center in Chile with high-fire potter Suze Lindsay. I’ve known Suze since she came to Louisiana State University as a grad student, and appreciate her sense of decoration and boundless good humor. We only overlapped for one year before I left the L.S.U. faculty to move to Florida and marry Leland Shaw (then an Architecture Professor at U.F. and a part-time potter). Ever since that time, we’ve felt we didn’t get enough time working together, and have wanted to work in studio together. The Curaumilla program is a great opportunity to come together with other potters who want to talk about form and surface in a beautiful place for 2 weeks. At Curaumilla, the trail has been blazed by wood-fire potters like Doug Casebeer and Randy Johnston, and Chris Gustin and Ron Meyers have also taught there. 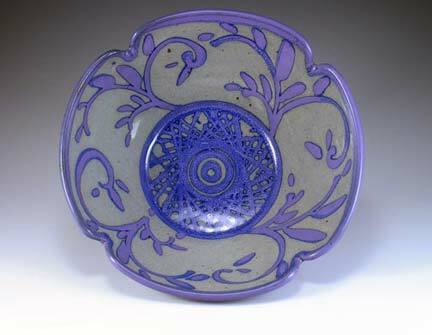 Suze and I wanted to expand the glaze palette to include more hue and value contrasts and more variety in color. The Curaumilla people dry-glaze and once-fire with wood. Hmmm. This should be a challenge. I think I’ll have to pot more thickly for my pots to survive dry-glazing. The glazes we’ve been looking at are common cone 10 reduction glazes, like Emily Purple, shinos, saturated irons like Ohata Kaki. The research in Frank and Janet Hamer’s book The Potter’s Dictionary of Materials and Techniques, and Robert Fournier’s Illustrated Dictionary of Practical Pottery say for once-fire dry glazing, clay content in glazes should be 10-20% (for leatherhard about 50%). Our glazes often has less clay, occasionally more. It was fun for me to be able to use glaze calculation to change the clay content in the raw glaze but keep the glaze oxides in the fired glaze the same. I’m just enough of a materials and glaze calc nerd to get myself in trouble, but I enjoy the informaton and the challenge. Richard Burkett, (potter, sculptor, San Diego State U faculty, materials guru, computer nerd, and musician) wrote HyperGlaze, originally a Mac-only program. It now runs on either PC or Mac platforms. It’s a lovely program, with a good-looking user interface and helpful support programs. Although I’ve used HG, I find I use a PC-only program, GlazChem, by Bob Wilt, most often. Perhaps it’s from familiarity, but I find the layout (while not beautiful) very functional. I have some glazes that can be imported into GlazChem posted on my website handouts page and a link to the patch that will let you use the help files in Windows 7. Note, when you install GlazChem, you have to right-click and do RUN AS ADMININSTRATOR, and ditto the first time you run it. GlazChem will let you try the program before you buy, and the cost is a nominal $35.00. With the help of GlazChem, I re-calculated some of my favorite U.F. cone 10 shop glazes to have about 10% clay. They don’t have frit in Curaumilla, and I read in my research materials that wood ash, although a raw material, is frit-like. Good solution. Cheap. They use it in China often. Ash will deflocculate the glaze and it should be flocculated with Epsom Salts to fix this before glazing. Ceramic Arts Daily video about doing this here. Wishing everyone happy holidays. It’s a positive and optimistic challenge to create things. Below, some high-fire decorated works I’ve done. 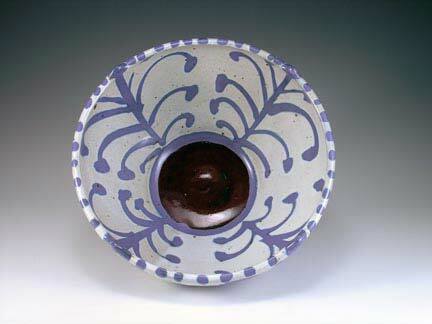 On the top 2, glazing method ws something I learned from Bill Brouillard: dip in Emily Purple, wax a design. Let the wax dry a bit, then wash off under the faucet all that is not waxed. Dry the piece overnight. Dip in a second glaze. Use a sponge to remove dots of glaze from wax. The Emily Purple is a magnesium-fluxed matt that will turn cobalt to purple. Where it overlaps with the celadon, the magnesium is diluted enough to make it shiny and back to blue. I love the blue line margin that happens. 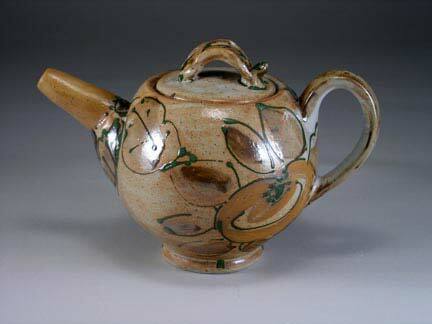 Teapot glazed in shino with in-glaze decoration of colorants + flux done like majolica.